The largest and longest running study of employee engagement and retention trends in the U.S. 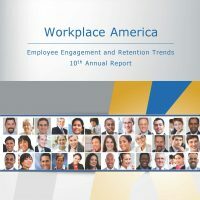 In Workplace America 2013, our 9th annual edition of this national report on employee engagement and retention trends, we’ve uncovered many new tactics and emerging strategies to help you engage and retain your valued employees. The 5 key lessons/priorities that will help you boost engagement and reduce unwanted turnover!